Three-quarters of the oil from BP's massive spill has been cleaned up or broken down by natural forces, government scientists reported, though the upbeat claims were met with some skepticism. White House energy adviser Carol Browner said that a new assessment found that about 75 percent of the oil had either been captured, burned off, evaporated or broken down in the Gulf of Mexico. That leaves about 53.5 million gallons in the gulf. The amount remaining - or washed up on the shore - still is more than four times the size of the 1989 Exxon Valdez spill. Federal officials say about a quarter of the oil evaporated or dissolved in the warm gulf waters, the same way sugar dissolves in water. Another one-sixth naturally dispersed, because of the way it leaked from the well. Another one-sixth was burned, skimmed or dispersed using controversial chemicals. "I think we are getting some good news out of the Gulf in terms of the information from the static kill and also what our scientists are telling us - the vast majority of the oil has been contained, it's been burned, it's been cleaned and that's good news for the people of the Gulf," Browner said on CBS' "The Early Show". Browner said the remaining oil is expected to "break down naturally." "Mother Nature will do her part, but we'll continue to be vigilant to ensure anything that comes on shore, the tar balls, the sheen, is cleaned up rapidly," she said. The report's calculations were based on daily operational reports, estimates by scientists and various analyses by experts. The government acknowledged it made certain assumptions about how oil dissolves in water naturally over time. Officials, while encouraged by the report, stressed that the fight wasn't over. "Less oil on the surface does not mean that there isn't oil still in the water column or that our beaches and marshes aren't still at risk," NOAA Administrator Jane Lubchenco cautioned in a news release. A Florida State University oceanographer who has long been tracking the spill, and who early on challenged the government's low estimates of its size, called the report "spin." "There's some science here, but mostly it's spin, and it breaks my heart to see them do it," said the oceanographer, Ian McDonald. "This is an unfortunate report," he said. "I'm afraid this continues a track record of doubtful information distributed through NOAA." Charter boat captain Randy Boggs, of Orange Beach, Ala., said Wednesday he has a hard time believing BP's claims of success with the static kill and similarly dismissed the idea that only a quarter of the oil remains in the Gulf. The administration defended the credibility of the newest estimates. Given earlier troubles with government estimates, NOAA Administrator Jane Lubchenco was asked Wednesday about the credibility of the numbers. She said the government used direct measurements and the best estimates available for the new report and has a high degree of confidence in them. She said the numbers can be updated as new information comes in. One of those updates came Wednesday, as the government revised the total amount of oil spewed into the Gulf to 207 million gallons, up slightly from 205 million earlier in the week. 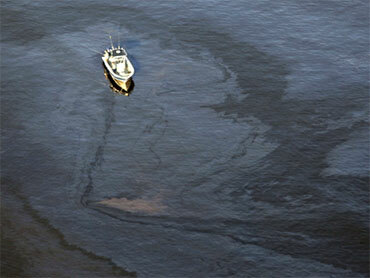 According to the report, a little more than 172 million gallons of that made it into the Gulf. Nearly 35 million gallons were held back by a temporary containment cap. Meanwhile, officials welcomed news from BP that it had plugged the broken well with heavy mud. The oil giant called it a milestone in ending the spill that started with an April 20 drill rig explosion off Louisiana that killed 11 workers. National Incident Commander Adm. Thad Allen said the static kill effort to plug the leak is progressing, giving officials "high confidence" that there will soon be no oil leaking into the environment. But the containment effort isn't over. Crews performing the so-called "static kill" effort overnight now must decide whether to follow up by pumping cement down the broken wellhead. Federal officials said they won't declare complete victory until they get into the well from the other end, and that won't happen for weeks. "This job will not be complete until we finish the relief well and pump mud and cement in through the bottom," Allen said. At the entrance to Gulf Islands National Seashore at Pensacola Beach, Fla., Don Allen still wasn't expecting to sell many snow cones or Italian sausages from his food truck. "I don't know where it went if it's not out there," said Allen, who had to lay off his son because business has been so slow as tourists abandoned beaches over the summer. "It's all just numbers, and it has changed so often." BP applied nearly 2 million gallons of a chemical dispersant to the oil as it spewed from the well, an attempt to break it into droplets so huge slicks wouldn't tarnish shorelines and coat marine animals, and to encourage it to degrade more quickly. In Washington on Wednesday, lawmakers pressed scientists to explain what effects the chemical, whose long-term effects have been questioned, will have on the Gulf's ecosystem. Sen. Sheldon Whitehouse, D-R.I., called use of the chemicals a "grand experiment" that didn't guarantee limited damage from the spill or make clear whether greater harm was possible. The 75-ton cap placed on the well in July had been keeping the oil bottled up inside over the past three weeks but was considered only a temporary measure. BP and the Coast Guard wanted to plug up the hole with a column of heavy drilling mud and cement to seal it off more securely. The static kill - also known as bullheading - involved slowly pumping the mud from a ship down lines running to the top of the ruptured well a mile below. A previous, similar effort failed in May when the mud couldn't overcome the unstemmed flow of oil.